Leopard prints is undoubtedly a fashion trend that is extremely stylish. Some of you might love it, some utterly hate it but either way you cannot ignore it. Even though they have been presented in clothes, bags, belts, earrings, the safest way to wear them is in a pair of shoes. They will provide the extra femininity you seek together with character and elegance. With black: Personally, I believe it is a heavenly match. Put on a black silk top with a pair of office trousers and your leopard print heels. Grab your brown handbag (or, even red) and off you go to your morning business meeting. And if you are a bit of a daredevil, match your leopard shoes with a pair of leather trousers and leave the rest to them. With white: Whether it is winter or summer, your little white dress moves up a level when matched with a pair of leopard print pumps. A forgiven “sin” of white’s purity. 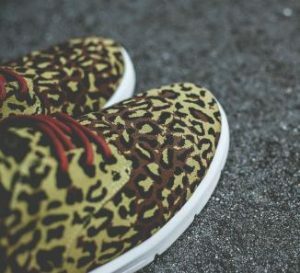 With bright, vivid colors: Red, blue, orange or even pink love to be walked on a pair of leopard shoes and they will definitely make you stop traffic. With neutrals: If browns, khakis, beige, olive-greens are your thing then leopard booties are perfect for you. You can wear them any time of the day picking shades that match the lighter tone of your shoes for a sleek look. With jeans: You cannot live without your favorite pair of jeans, I know, but what you can do is add a bit of edge to them. Your classic denim look will make a feminine, carefree statement with a pair of leopard flats. Mix and match: Wearing an all one color outfit works wonders with leopard print shoes. Still, you can go a step further with a bit of mix-and-matching. An excellent combination for an elegant outing is a black pencil skirt with a red ethereal top and your leopard stilettos. A pair of shoes set to wake up the animal in you!